Object consists of 9 ICs in a cardboard box. 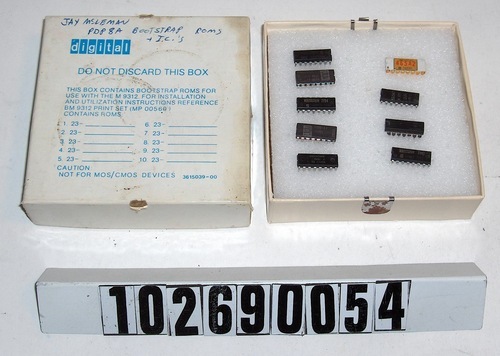 Handwritten on the box is, "Jay McLeman PDP8 A BOOTSTRAP ROMs + I.C.'s". Printed on the box is, "THIS BOX CONTAINS BOOSTRAP ROMS FOR USE WITH THE M 9312."